I think you should come over to South Africa and I will crochet you a few of those! So very pretty. I am so proud of you for letting only one tear spill when hubby said no the first time. I would LOVE to visit you in South Africa…maybe someday I will! And you are always welcome to crochet one for me. 😉 Blessings, friend…hope you have a fantastic week! Thanks, friend…and yes! I’d love to meet you at Allume! Blessings. You look great in it! And what an awesome husband you have. God can bless us with the smallest things through the best people. So happy you got what you wanted! Thank you, Sarah! That’s my favorite part of the story…the fact that he made a point to remember because it was important to me. Blessings and happy week! You are so fun – and this vest is totally you. Love it! Well, *blush*…and yep, I promise it will be there! Can you believe in TEN WEEKS we’ll be giving (in)RL hugs? I can’t wait! Blessings and happy week to you, friend! You are sweet, friend. The funny thing is that I can crochet…just cute hats and scarves. 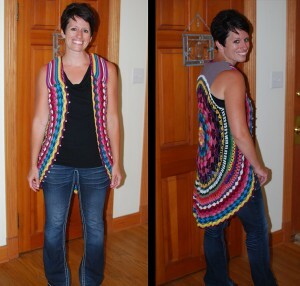 I’ve looked at patterns for things like this vest several times, and it all looks too overwhelming. Maybe someday I’ll find the time to figure it out, though! But you are welcome to adopt me anyway. 😉 I’ll say a prayer that the perfect boots will show up, too…I know it sounds crazy, but in the last two years, I’ve found two great pairs of boots at Goodwill. You never know what you might find there! Blessings and happy Tuesday! You look great in your new vest! I know there are a lot of people saying they can make that. I can NOT make anything and understand the importance of a great find and amazing deal! I especially can appreciate a husband who is awesome online. I would be lost if it were not for my tech savvy man! Enjoy! You look adorable! I agree with that…in all honesty, my blog would be a disaster without my hubby. He’s so great about helping me out with things like that (including ebay auctions!). 😉 Thanks, friend…I hope your week is wonderful! I love the vest! We do the same outbid-everybody-at-the-end thing on eBay. It actually has a name – “sniping”! Also, we have a connection with Didi BenAmi. Her sister Elinor was a classmate of my oldest daughter’s back when they were in middle school and high school. Dana actually knew Didi a little, like you know your friend’s siblings. Thanks! And I never knew we were “snipers”! 😉 That’s an awesome connection to Didi, too…it totally made me smile. Hope you have a fantastic week, sweet friend! Blessings! Ok first you are totally BEAUTIFUL !!! Love the vest! I think it would have been a dress on me 😉 I was reading your words and my heart smiled……Just another reminder that sometimes the very BEST things come from the waiting…..and it makes them all the more beautiful Thank you for your words today…..He whispered to me and that makes them all the more precious….love to you sweet friend!! Ok, friend…you are just the sweetest. Thank you. You are a blessing…thank you for stopping by to read my words and bless me with yours. Love to you…happy Tuesday! Totally made me smile! I only know you through online, but that vest is totally YOU! It is very pretty….I like it! You are sweet…thank you, friend! Oh Mel – you totally crack me up. This is why we’re great friends You write simply and awesomely and personably… and I love it. It’s like we’re hanging out in your living room chatting. And this vest must must must make it into your bag for allume. MUST! It’s not me at all, but totally you Love it! You make me smile, friend…thank you. Yep, the vest will be there…I decided it’s worth saving for the most special days, and Allume is definitely up there! I seriously can’t wait until we can finally chat (in)RL…it’s getting close! And if you need anything in the next weeks, let me know…I’m here for you and praying for you! Love you, friend! OMW! That is FABULOUS!!! What a wonderful man you have. Thanks! Yep, he’s pretty great…I think my favorite part of the story is that he made it a priority to remember because it meant so much to me. Blessings, friend! Oh my heavens…you had me cracking up and smiling so big!! I love that you finally got your vest…after all that waiting and never forgetting about it! Such a cute and fun story…and it looks adorable on you! Thanks, Eva! You are sweet…blessings and happy week to you! Thank you, friend! You’re sweet. Best EBAY story EVAH!!! Love it. I would spot you a mile away at Allume with that vest on! This is a great piece!! Thanks, friend! 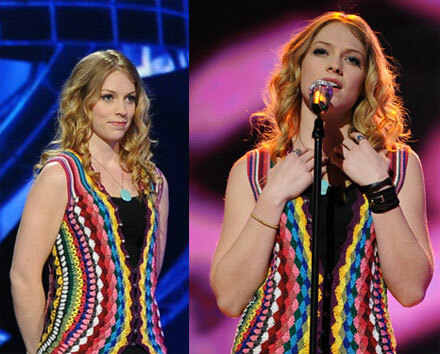 I’m sure the vest will make an appearance at Allume…not sure when, though. I’ll just have to surprise y’all. Blessings! Friend… I love this story and the vest!!! And I think it’s so much better because you waited sooooooooo long to get it… Who says instant gratification is where it’s at. I’ve thought of that…if I had gotten it right away, I’m sure it would be buried in a pile by now. I think it’s sweeter now. Thanks, friend…hope you’re having a great week! I am sitting here just grinning as I read your story. It is crazy how as we settle into life it just takes the little things to make us happy. I love the vest but love that he remembered even more. I love that, too. Just looking at the vest makes me smile and reminds me that he loves me. Thank you, friend…hope you are having a beautiful week! Blessings! Wow. What a story! You are a gifted storyteller. I was smiling and tearing up at the same time. Have a great week and wear the heck out of that vest! You are so kind, friend…thank you for that. Blessings and happy week to you, too! I am getting the Couch Rebel book and can’t wait to read your story there too! Aw, that means a lot…thank you, friend! I look forward to seeing you in church with it on, singing your heart out with a bigger smile than usual as you song lead! I’ll have to wear it next time I sing. 😉 Thanks, friend! I grinned from ear to ear reading this. I know well how a piece of clothing or adornment can transform. So I get it and I appreciate your story. The vest IS fab and you look great in it. Congratulations on the fashion score and anniversary blessings to you both! Thank you for your sweet words, friend! Blessings and happy week to you! Cool…I bet it was awesome! Yep, I probably would have. Especially with some of the styles that are coming back, I have to show a lot of self control or I’d buy way too much that I don’t need. 😉 Hope you’re having a great week, friend! Fantastic! I think the vest rocks. And its awesomeness becomes you. Well done! Thanks, friend! Blessings…hope you’re doing well! I am indeed well, thanks. Just crazy busy with four different projects at the moment. I’ll blog about it at some point. LOVE the vest, and your story behind the picture! Bless you today, Mel! Thank you, Ashley! Blessings back at ya!